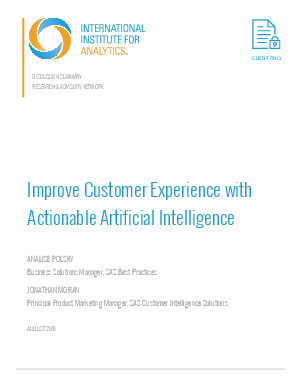 Artificial intelligence and related forms of advanced analytics hold enormous potential for marketers to expand and deepen customer intelligence, improve business processes, and deliver engaging customer experiences. But many marketing organizations are just getting their feet wet in leveraging these technologies. To learn about the opportunities and challenges, IIA spoke with Analise Polsky, Business Solutions Manager, SAS Best Practices and Jonathan Moran, Principal Product Marketing Manager, SAS Customer Intelligence Solutions.